Hey guys! I have some new (to me) products that I've been trying out & am super excited to share my opinions & experiences with you. Lock-It Concealor Cream in the shade M23. The concealer has been such a pleasure to work with, Every time I use it, it applies, blends & wears like nothing else I've tried before. Before this concealer I used the It Cosmetics! Bye Bye Undereye, which was a bit on the thicker side. However it gave me the full coverage I appreciated, & to be honest I thought it was absolute perfect however you know the feeling when you think somethings great then you try something else & all of a sudden the new product has you in complete & utter awe. That was this concealer for me, it's extremely creamy & pigmented. There was no creasing in my under eye area, it also helped even out & conceal the tiny bumps I have under my eye. 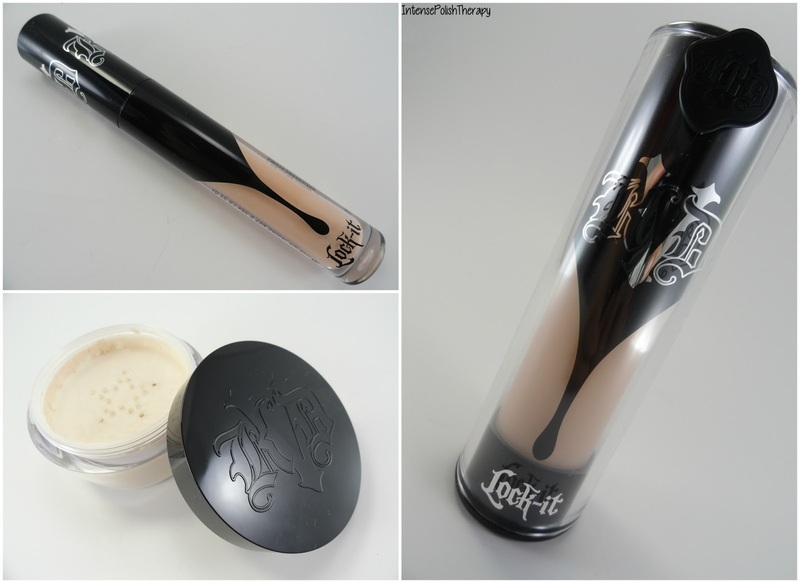 Lock-It Foundation in the shade Light 48 Neutral was surprisingly perfection to work with. I've been using Youniques liquid foundation non-stop for about 5-6 months. & much like the concealer case, I really did enjoy it & to be even more honest, for some reason I have this thought in my head that high end foundations weren't worth it. However I just realized when comparing the two foundations that my Younique foundation costs $47.00 for 20 ml (0.68 fl oz.) when the Kat Von D foundation only costs $42.00 & contains 30 ml (1.0 fl oz.). Which truly has my mind blown. The Lock-It foundation is fantastic, it's very creamy & full coverage. The formulation is beautiful it's not too thick or too thin, the coverage is fantastic. The new Lock-It Setting Powder is really is something I got super excited about when I heard Kat Von D was launching one. I really do enjoy trying out new setting powders because I'm always looking for the perfect products that'll work beautifully with my skin. The packaging for this is absolutely beautiful, I even love the start shaped sifter. There's no scent which is a nice, I didn't get any creasing while using it & it didn't cake my concealer. Is it the perfect setting powder for me, I don't know yet. I really do love it & I'll gladly continue to use it but it wont prevent me from trying new setting powders either. On my lips is the Everlasting Liquid Lipstick in the shade Witches. Kat Von D's beauty line has so many fantastic products, I can't wait to try more. It's like only I've tried & love this product now I need to try another one, & another & another. It really is a beautiful vicious circle.